The Grammar Guru thinks the sixties were a decade of great fashion. People in the '60s dressed up for most occasions. 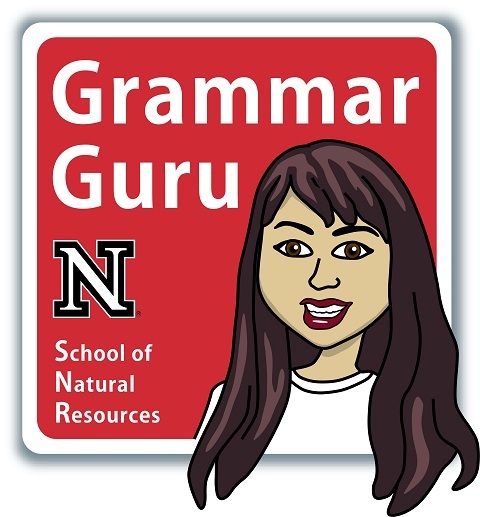 Mekita Rivas, SNR communications and project associate, publishes a biweekly feature called "Grammar Guru." Every other week, the Grammar Guru will share writing tips to help make your work as polished as possible. Some of these tips may address common spelling errors, while others will examine the many nuances of the English language. When referring to a year, always use numerals. Do not spell out a year. It is acceptable to spell out a decade span and to abbreviate a decade span on second reference. When abbreviating a decade span, put an apostrophe before the numbers (facing the correct way) but NOT before the "s." A decade cannot possess anything! He graduated in 1992. The nineties were a great decade. He thinks the '90s were overrated. Need some grammar guidance? The UNL Style Guide (http://unlcms.unl.edu/ucomm/styleguide/) is a great resource for all university employees. If you have writing questions that the style guide doesn't answer, feel free to email the Grammar Guru at mrivas@unl.edu.